Tuesday, March 10th, marks the fifth annual National Women & Girls HIV/AIDS Awareness Day. Teenage girls and women are among the fastest growing group of new cases of HIV. By wearing red today, help make the women and girls in your life more aware of the importance of prevention, treatment, and knowing their HIV status. Every 35 minutes, a woman tests positive for HIV in the USA. These are the shoes I’ll be wearing on March 10th to show my support along with a SupportStore Red Hope Courage Faith wristband. In 2007, more than a quarter of diagnoses of HIV infection in the United States were among women and girls aged13 years and older. Worldwide, half of the estimated 33.4 million people living with HIV in 2008 were female. In 2008, HIV was the leading cause of disease and death for women of childbearing age. Black women in the USA suffer disproportionately from the HIV/AIDS epidemic, as they acquire new HIV infections at nearly 15 times the rate of white women. The CDC estimates that 1 in five people living with HIV infection in the United States do not know they are infected. 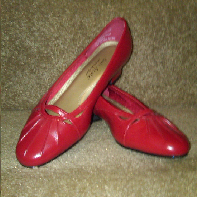 Some organizations, like The Red Pump Project, work hard to spread awareness “of the increasing impact of HIV/AIDS on women & girls and encourages ladies to take action.” They ask that women “Rock the Red Pump” and wear red shoes to help share this message. Our “AIDS Awareness” wristband is made from seamless 100% silicone rubber in an adult 8″ universal fit size. All of our Rubber Bracelet Wristbands come packaged in an individual polybag. Each Aids Red Ribbon Brooch Pin requires 2.5 hours to make; handcrafted by Bridges of Future Orphanage Home in Livingstone, Zambia which was founded in 2004 by Norman Banda due to a high increase in number of orphans in the country. Click here to read more. 40% of the proceeds from sales of these pins are donated to Bridges of Future Orphanage Home. Our 3.5″ x 8″ AIDS Awareness Ribbon Magnet is manufactured and printed in the USA. We print on premium quality, super-thick (.030) magnetic material with UV protected inks. * Statistics from U.S. Department of Health & Human Services press release, March 2, 2010.